Now in its fifth year, the “State of Marketing in Retail Banking” study, fielded by The Financial Brand, sponsored by Deluxe, and analyzed and published by the Digital Banking Report, has found that while bank and credit union marketers know the challenges and opportunities of today’s marketplace, there continues to be a product (rather than consumer) focus and the movement to digital communications is occurring at a snail’s pace. Building on a reputation as the leading benchmark for changes in the retail banking industry, the 2016 Financial Marketing Trends Report has found that banks and credit unions of all sizes are not changing their priorities, strategies and budgets fast enough to respond to an increasingly demanding digital consumer. Despite a desire for increased measurability and a focus on return on investment (ROI), these objectives are not being reflected in an investment in advanced analytics or a shift in channels shown by other industries. While digital experimentation is evident, it is not prevalent. The report compares this yearï¿½s results with those of previous years to illustrate how strategic priorities, product emphasis, social media use, branding, marketing measurement and effectiveness have changed by institution type and size of organization. There is even a section on branch network growth strategies. 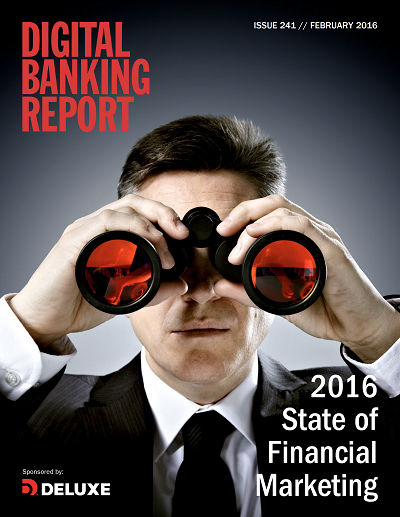 The 56-page Digital Banking Report, ‘2016 Financial Marketing Trends,’ provides the most comprehensive review of marketing, product, branding, media and branching trends in the industry, combined with in-depth analysis, charts and marketing budget breakdowns not found elsewhere. We would like to thank Deluxe, who sponsored this yearï¿½s report development and distribution. Their partnership enabled us to reach more industry executives and compile more statistics than ever before. Results of our annual survey of financial institution marketers, providing details on the products promoted, channels used and budget allocation.